Our employees are highly qualified electronics engineers. Electronics is not only our job, it is also our hobby. We are open-minded, and cope with problems, where other service teams gave up or suggested only to replace the faulty equipment by a new one. With over 17 years’ experience we are still a young company but we hope to increase our activities and broaden our scope in the near future. That is why we are interested in establishing co-operation ties with your company. We have been collaborating with several shipping companies and can promise you unrivalled service in matters of expertise, quality and price. • Riding squads – emergency or planned repairs worldwide. • Main Engines and Auxiliary Engines automation, electronic control and monitoring systems repair and modification (printed cards repair and calibration), especially Microcentralog, Autronica, AMT, Vista, oil mist detectors. 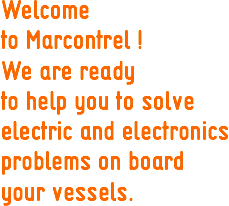 • Ship’s machinery automation and electronic control system repair and calibration. • Electric cargo cranes automation and electronic control system repair and calibration, especially Brissonneau & Lotz Marine equipments (BLM). • Fire alarm and monitoring systems repair, calibration and modification, especially old-fashioned systems. • Cathodic protection system repair. • Ballast / fuel tanks level monitoring systems repair (such as bargraph indicators, ballast sensors etc.). • NMEA acquisition system manufacturing. • Ship’s telephone systems repair and modification. • Designing and manufacturing replacement for electronic cards. • Boilers electronic control system repair and calibration. • Bridge equipment such as echosounders, courserecorders, wind indicator repair, calibration and modification (except radars). • Ship’s paging systems repair, programming and modification. • VHF/UHF transceivers and communication devices repair and calibration. • Spare parts & equipment supplies worldwide.